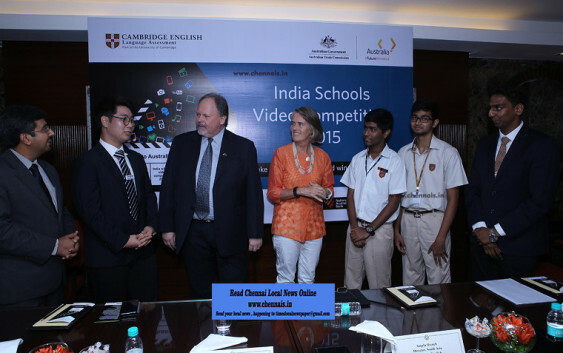 Chennai: Young film makers from schools across the country get the chance to fly to Australia, awarded by Cambridge English Language Assessment – a department of the University of Cambridge – and the Australian Trade Commission in India. Students, who are interested in making short films, now have a chance to prove their talent on the national stage and earn the chance to win a study trip to universities in Australia. 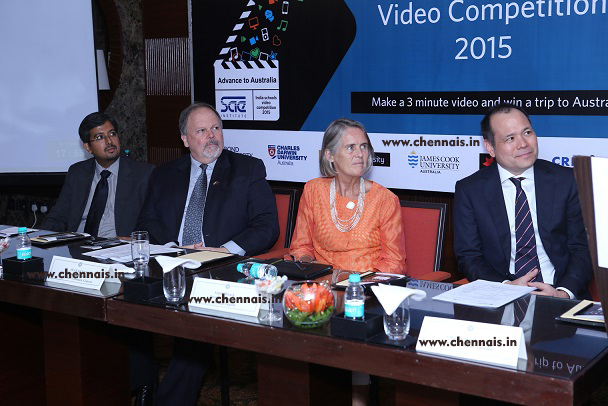 Chennai: Young film makers from schools across the country get the chance to fly to Australia, awarded by Cambridge English Language Assessment – a department of the University of Cambridge – and the Australian Trade Commission in India. Organized by Cambridge English and the Australian Trade Commission, the competition is sponsored by the 4 Australian university partners – Bond University, Charles Darwin University, Curtin University and James Cook University. National Australian Bank and Credila are the travel sponsors and SAE Institute is the knowledge partner. The prizes – one week study trips to Australia for the 4 winning teams each comprised of 2 students and their teacher – are provided by the four sponsoring universities. The prize includes return flight tickets from India to Australia for the teams, accommodation and other travel and living expenses for 5 days in Australia for the study programme. The teams should make a 3 minute video on one of these themes, upload their entries to YouTube and submit the link to compete. Students cannot register for this competition independently, instead, their schools need to register on www.a2oz.org and enter their names to become eligible to participate. Registration for the competition commences on 7 October, 2015 and the entries can be submitted between 15 December 2015 and 15 January 2016. 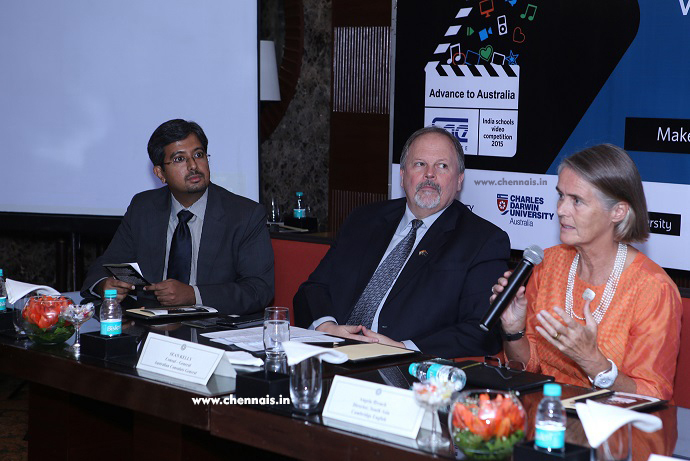 Young film makers from schools across the country get the chance to fly to Australia, awarded by Cambridge English Language Assessment – a department of the University of Cambridge – and the Australian Trade Commission in India. Technical sessions on video production will be conducted for schools and students across India to help the students with their entries. These workshops, which will be held between 26 October and 5 November are conducted in partnership with the SAE Institute and will feature Australian experts who will train the students on filmmaking and production. The four sponsoring universities will also host webinars on the competition’s themes. Please visit www.a2oz.org for more information on the competition. In connection with this, the media launch of the competition was held on 7 October 2015, at the Willingdon Hall, Taj Coromandel. Angela ffrench, Director of Operations, South Asia from Cambridge English and Sean Kelly, the Australian Consul-General, represented Cambridge English and Austrade respectively, at the launch. Cambridge English Language Assessment is part of the University of Cambridge. They develop and produce the most valuable range of qualifications for learners and teachers of English in the world. Over 5 million people in 130 countries take their exams every year. Around the world over 20,000 universities, employers, government ministries and other organisations accept their certificates. Rated by Good Universities Guide 2014 as Australia’s top university Educational Experience, Brisbane’s Gold Coast based Bond University is committed to providing a personalised academic environment that offers students an exclusive educational experience of the highest international standards. Charles Darwin University is a young and dynamic institution which is located in Darwin, a very cosmopolitan, tropical and vibrant young city of diverse nationalities, making it a multicultural study environment. CDU various degrees, diplomas and certificates to help students be job-ready. Curtin University is Western Australia’s largest and most culturally diverse university with campuses as well as face-to-face teaching in a number of countries. This cultural diversity prepares all graduates to live and work effectively in a global environment. Located in Mumbai, NAB’s first branch in India acts as a trusted partner for clients in India looking to expand or invest in Australia or New Zealand, particularly in the energy, education and agribusiness sectors. Further, NAB’s Migrant Banking team offers its services to clients who are migrating to or leaving to study in Australia and New Zealand. Credila, an HDFC Ltd. Company, pioneered the concept of specialist Education Loan Lender and became India’s first Dedicated Education Loan Company. Credila funds students for higher education in both India and overseas. Students can get their education loan pre-approved even before they start applying to universities. SAE has 50 campuses among 26 countries offering Bachelors level programmes in various creative media. Using strong industry ties with experts in various fields, formal and informal internships, SAE students go on to achieve great success in their chosen creative media fields.